A recent study into extinction patterns among ancients mammals, including the horse, will help scientists predict how today’s species are likely to cope with climate change. The news is not altogether encouraging, with the diversity of species that proved the strength for mammals during past extinction events dwindling in recent centuries through record numbers of extinctions. The researchers found that diversity proved to be the mammal’s best defense against in adapting to climate change. That was one of the conclusions of the first study of how mammals in North America adapted to climate change in “deep time” – a period of 56 million years beginning with the Eocene and ending 12,000 years ago with the terminal Pleistocene extinction when mammoths, saber-toothed tigers, giant sloths and most of the other megafauna, on the continent, including the horse, disappeared. “Before we can predict how mammals will respond to climate change in the future, we need to understand how they responded to climate change in the past,” said Larisa DeSantis, the assistant professor of earth and environmental studies at Vanderbilt University, in Tennessee, who directed the study. Establishing such a baseline is especially important for mammals because their ability to adapt to environmental changes makes it difficult to predict how they will respond. For example, mammals have demonstrated the ability to dramatically alter their size and completely change their diet when their environment is altered. In addition, mammals have the mobility to move as the environment shifts. And their ability to internally regulate their temperature gives them more flexibility than cold-blooded organisms such as reptiles. The study, published on April 23 in the open-access journal PLoS ONE, tracked the waxing and waning of the range and diversity of families of mammals that inhabited the continental United States during this extended period. The researchers performed their analysis on 35 different families, such as bovidae (bison, sheep, antelopes); cricetidae (rats, mice, hamsters, voles); equidae (horses, donkeys); ursidae (bears); mammutidae (mammoths); and leporidae (rabbits and hares). The study found that the relative range and distribution of mammalian families remained strikingly consistent throughout major climate changes over the past 56 million years. This period began with an extremely hot climate, with a global temperature about six degrees hotter than today (too hot for ice to survive even at the poles) and gradually cooled down to levels only slightly higher than today. It was followed by a dramatic temperature drop and a similarly abrupt warming and finished off with the ice ages that alternated between relatively cold glacial and warm interglacial periods. DeSantis said the information gathered clearly showed that most families were extremely resilient to climate and environmental change over deep time. 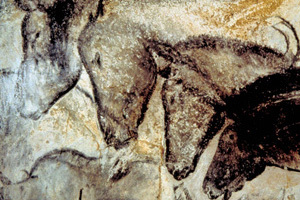 Horses were consistently the most widely distributed family from the Eocene to the Pliocene – and remained highly dominant, just not number one, in the Pleistocene. In contrast, families with more restricted ranges maintained lower range areas. Thus, the researchers’ work demonstrates that mammals maintained similar niches through deep time and is consistent with the idea that family members may inherit their ranges from ancestral species. The idea that niches are conserved over time is a fundamental assumption of models that predict current responses of mammals to climate change. The analysis also found a link between a family’s diversity and its range: Families with the greater diversity were more stable and had larger ranges than less diverse families. “Diversity is good. The more species a family has that fill different niches, the greater its ability to maintain larger ranges regardless of climate change,” DeSantis said. While most families during certain periods of time yielded either gains in species/genera (for example, Oligocene to Miocene) or losses (Miocene to Pliocene), these changes were remarkably consistent through time, with overall gains or losses in one genus typically yielding a gain or loss in of about two species. Although the extent of family ranges remained relatively constant, the study found that these ranges moved south and east from the Eocene to the Pleistocene. That is most likely a response to the general climate cooling that took place during the period. However, southeastern movement of ranges from the Pliocene to the Pleistocene may also be complicated by the influx of South American animals when the Isthmus of Panama was formed. This triggered a tremendous exchange of species that has been labeled “The Great American Interchange”. As a result, some of the southern movement of families’ ranges may have been due to the influx of South American mammals, like the sloth and armadillo, moving north, the researchers cautioned. The study also looked for evidence that families containing megafauna or other species that went extinct during the terminal Pleistocene extinction (also known as the Quaternary or Ice Age extinction) might have been in decline beforehand, but failed to find any evidence for any such “extinction prone” families. If climate change was the culprit, DeSantis and her team expected to see differences between families containing megafauna and those composed of smaller animals. However, the fact that they didn’t find such evidence cannot completely rule out this possibility. The role that diversity plays in mammalian adaptation is particularly important because mammal species have been going extinct in record numbers for the past 400 years. In a 2008 report, the International Union for the Conservation of Nature predicted that one in four species of land mammals in the world faces extinction. As a result, the diversity of mammalian families is declining at a time when they need it the most to cope with a rapidly changing climate. Co-authors on the paper were graduate students Rachel A. Beavins Tracy, Cassandra S. Koontz, John C. Roseberry and Matthew C. Velasco. The project was supported by funds from Vanderbilt University.